Oral-B Genius 9000 White Electric Toothbrush incl. 3 Brush Head Refills & Smart Travel Case is rated 4.7 out of 5 by 121. Rated 5 out of 5 by KBlovesproducts from Awesome Product This is our first electic toothbrush and I am glad we have selected this to be it! My husband and I both purchased one and have seen significantly changes in our smile, gum health and overall confidence. I really enjoy the functions of the app such as reminding me when I have dentist appointments, the handy tips and information and news reel and weather reports. We have not been disappointed. Some things that would be handy would be to be able to move through the different functions without having to turn on the toothbrush. For the app to be able to inform us how much percentage (battery life) is left in the toothbrush. Rated 5 out of 5 by AB29 from Great toothbrush I have been using this for almost a month now and my teeth are noticeably cleaner after using it. Having previously only used a manual toothbrush, it took a couple sessions to get used to it but it was worth it. The different brushing modes are handy for various teeth treatment. I appreciate how it can connect to the phone app so you can monitor your brushing regime and technique! The battery lasts for roughly 25 sessions using daily clean mode. Overall this is a great product albeit a little pricey. At this price I would have appreciated getting the other 2 brush head types (only 3 were included). Rated 5 out of 5 by Lauren from It really is .. Genius ! I bought this as a Christmas present to myself and so glad i did. After recently having braces and now having wires against the back of my teeth i was finding it hard to get to the areas i needed with a normal tooth brush. I was unable to get to a build up of plaque on my lower teeth. The Genius 9000 has a brushing mode for whatever you need and i have finally been able to maintain and remove the build up of plaque. It is extremely stylish and the travel case has already come in handy. 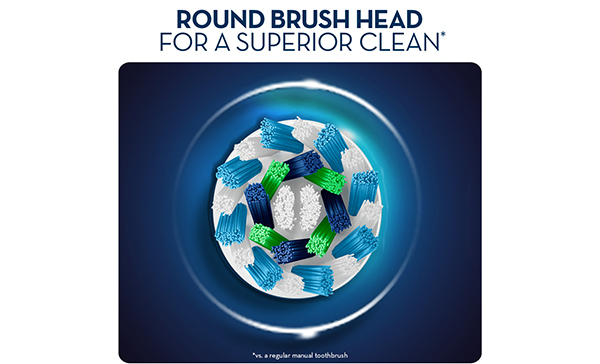 It make's brushing so much more fun especially with the oral-B App and precision detection. Overall its an excellent and well made electric tooth brush, and a more professional clean. Value for money! Rated 5 out of 5 by Wend from Happy Teeth My daughter and I recently purchased the Oral B Genius 9000. I bought the white and she bought the Rose Gold. After only one use, we raved and raved about our new toothbrushes and msg my son and insisted he buy one. Our teeth and gums felt so clean and fresh and we loved the fact it came with all different features and also different types of toothbrush heads.The fact that you can take it travelling was an instant seller for both of us. We normally take battery operated ones and they just don't clean as well. We are both 100% HAPPY and would recommend to everyone. Rated 5 out of 5 by Brownie from Excellent tooth brush! I have had this for a few weeks now and the first time I used it I noticed what a huge upgrade it was from the oral b pro. Love all the features, not that I use the app but handy to have it you want to monitor how you brush your teeth. The battery life is awesome. Lasts at least 10 or more days one one charge using it twice a day. I also love the travel case. This is a great feature and I have used it a few times now. All in all I highly recommend this brush! Don’t pay full price though, wait till a great sale comes up like I did. Then I couldn’t refuse. Rated 5 out of 5 by Thylaseen from Great product I bought this online after doing a fair bit of research and noticing how much cheaper it was through Shavershop. Without a doubt the best electric toothbrush I have ever used. I am yet to try the app or two of the supplied heads but I can honestly say that my teeth have never felt so clean. I was also relieved to discover that the charging base station can be detached from the additional brush head compartment to save the need for extra bench space. After seeing my 9000 my partner has now bought himself the black version and that looks very slick. Rated 5 out of 5 by af19 from What an upgrade! I purchased this as I don’t get to the dentist very often due to living hours away from the closest one and I believe you can’t pay enough to keep your teeth healthy and clean. I previously had a cheaper ($30-40) Oral-B toothbrush but wanted to upgrade. I used the floss brush head first and my teeth had never felt cleaner! Aesthetically, this toothbrush is lovely as is the smart travel case. I travel quite a lot and am looking forward to using the case along with the smart charger. I especially like the battery level notification and pressure functions along with the multiple brush modes. The brush is easy to use as is the app and you can control most settings such as timer and brush mode either via the toothbrush or through the app. Rated 5 out of 5 by Shan88 from Like having a dentist in my own home! Absolutely love this toothbrush! It was an upgrade from my previous basic model Oral B and the quality of the clean is worlds apart. There is just so much to love about this brush. It looks gorgeous, it comes with 3 different brush heads and a really awesome travel case. Love that I can personalize the colour band on the brush also. My teeth feel so smooth and clean, I feel like I have had them cleaned at the dentist. Only used the app a handful of times as I find it isn't really accurate with picking up where I am brushing. Overall a GREAT product.